Located in northern Lancashire, the Forest of Bowland includes wild upland and cultivated valleys. Essentially part of the main Pennine range, the area is dominated by gritstone fells with summits above 450 m and large areas of heather-covered peat moorland. Pendle Hill, a large isolated hill, is located in the south eastern edge of the area. The foothills around the central core of high land are notable for their steep-sided valleys which open out into the cultivated lowlands of the Ribble, Wyre and Lune Valleys. This lower land is criss-crossed by drystone walls and is dotted by farms and villages built from the local stone. This contrast in landscapes between the green lowland and wild uplands is an essential character of the area. Well-wooded and dotted with picturesque stone farms and villages, these lower slopes, criss-crossed by drystone walls, contrast with and complement the dramatic open sweep of the gritstone heights. The moors provide a valuable habitat for upland birds whilst the lowlands contain woodland habitats that suit a wide variety of species. The local gritstone is widely used as a building material and Slaidburn and Newton are two traditional villages that have seen very little development. 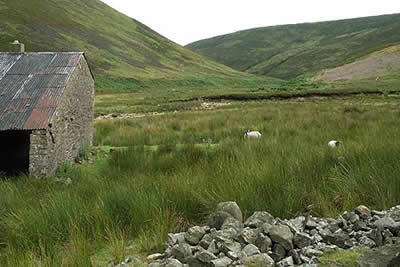 Sheep and beef farming is an important source of income for the uplands with dairy farming using much of the valley land. Tourism is an important sector of the area's commercial life with many large towns and cities within an hours drive of the area. Walking opportunities and wide and varied. The fells and moors offer some wonderful high level walks and with few walkers you can usually walk in relative peace and quiet. There are also many valley walks often linking smaller villages or following one of the major rivers. Pendle Hill is also worth climbing with the 'tourist route' providing a fairly straightforward way to the top. In good weather the summit offers exceptional views particularly north over the Yorkshire Dales National Park.